Andheri Bridge Collapse: Gokhale bridge connects Andheri East and Andheri West stations and is used by thousands of commuters each day. 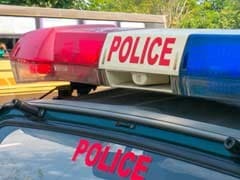 A section of a bridge caved in at Andheri station in Mumbai this morning following incessant rain, leaving five people injured, with two said to be in critical condition. No casualties have been reported from the collapse. The Gokhale bridge on SV Road connects Andheri East and Andheri West stations and is used by thousands of commuters each day. A part of the bridge, which is on the southern end of Andheri station between platform numbers 7-8, crashed around 7.30 am, ripping off overhead wires which were left on the tracks. Traffic at the bridge has been stopped and trains, which are the lifeline of India's financial capital, have been affected. The routes of some local trains on other lines have been extended to clear the spillover at Ghatkopar station, officials said. Local trains are running between Churchgate (in south Mumbai) and Bandra (in the western suburbs), and between Virar (located in neighbouring Palghar district) and Goregaon (western suburb), a Railways official told news agency Press Trust of India. Operations at the Harbour line section have been restored. The first local train ran at 2.19 pm, since the bridge collapse occurred. Railways minister Piyush Goyal had earlier tweeted saying railway officials were working towards restoring harbour line operations by 2 pm. Trains running from the Harbour line section run from Andheri station to Chhatrapati Shivaji Maharaj Terminus (CSMT) in south Mumbai. 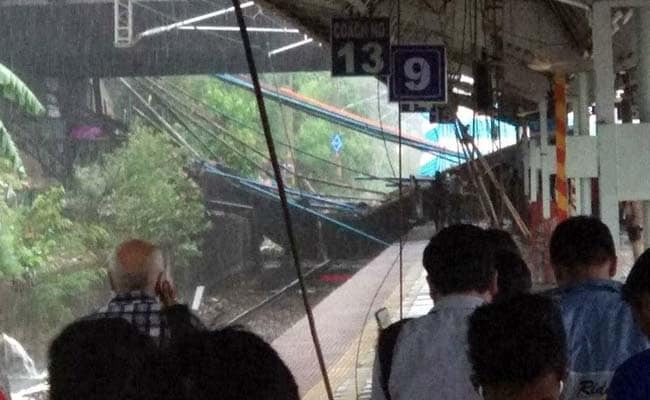 The bridge crash damaged a portion of the platform roof, blocked railway lines and damaged high-tension electric wires and overhead power equipment, according to an IANS report. A team of engineers are working to restore services, an official said. Officials said the debris has to be removed and the wires fixed before trains could resume. 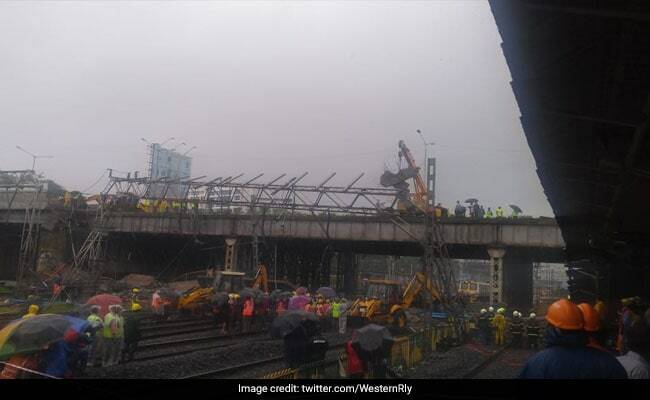 Meanwhile, Western Railways has tweeted saying cranes have been deployed to lift the slabs of the bridge from the railway tracks. Fire brigade personnel, the National Disaster Response Force, Mumbai and railway police along with Brihanmumbai Municipal Corporation (BMC) officials are working to clear debris. 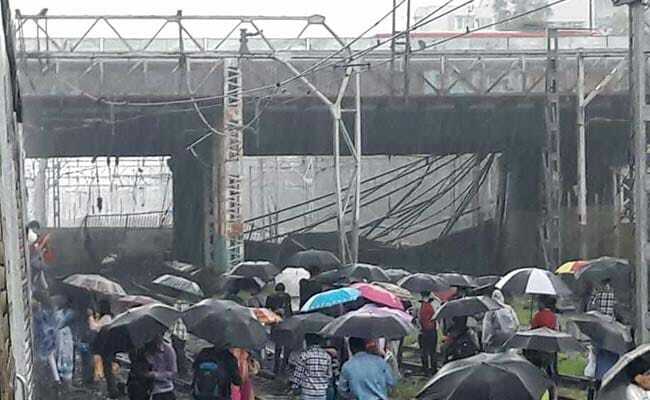 "A part of the foot overbridge has collapsed which has halted our up and down services of Western Railway. Our officers have reached to the spot and accessing the situation," said Western Railway spokesperson Ravinder Bhakar. "Thankfully, no train was passing beneath the track," he added. A tweet from the Maharashtra chief minister's office said chief minister Devendra Fadnavis has asked Mumbai's municipal body chief to increase frequency of the city's BEST buses. Around 39 extra BEST buses have been arranged on the western line route from Bandra to Andheri. Piyush Goyal also ordered a probe into the Gokhale bridge collapse. Reports suggested a traffic jam building up in the area. Mumbai's Dabbawalas have suspended all their tiffin box deliveries in this part of the city, but would continue on other routes. Prashant Ghag, a commuter, said, "When I reached Borivili to board a Churchgate bound train, I came to know that all the lines of Western Railway have come to a halt. With no alternate commute in such rain, I had to return home." It has been raining heavily in Mumbai since last night and parts of the city are waterlogged. Don't believe in rumours. Crowd management machinery on Central Railway stations have been strengthened. Harbour line passengers are allowed to travel on Central Railway main line suburban section. The meteorological department has predicted heavy rain in the next 48 hours. Western Railways has released helpline numbers in view of affected traffic. The following are the helpline numbers- Andheri: 022676 30054, Churchgate: 02267622540, Borivali: 02267634053, Mumbai Central: 02267644257.